Scientists involved in AKCRRAB research highlight their work in a newsletter called AKCRRAB News Flash. Subscribers will receive the newsletter electronically, and the latest issues are posted here. Older issues are in the News Flash archives. To receive AKCRRAB News Flash by email, contact Sue Keller, (907) 474-6703. Last modified 25 February 2016, 3:29pm AKST. 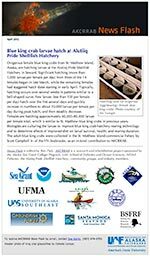 For website issues, contact Alaska Sea Grant web coordinator.